Healthcare is evolving and changing at unprecedented rates thanks to the utilization of new and emerging technologies. This brings us great innovations in the care we provide, but it is not without it’s casualties. In order to combat the threat of staff revolt, passionate and skilled nursing informatics professionals rush to the front lines to save the day. Although these IT crusaders are at the forefront of digital change, they often work behinds the scenes in hospitals, and if they do their job well, you might not know they exist at all. It's time to honor these champions as they are the unsung heroes of Health IT. 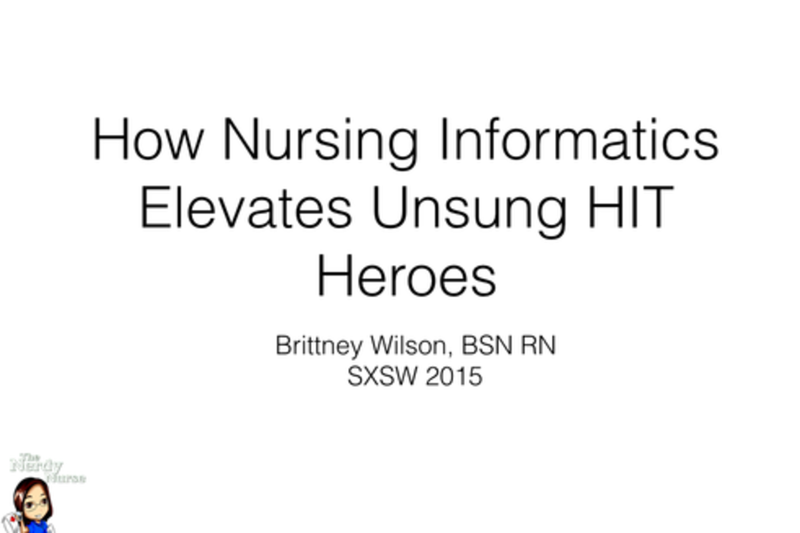 Brittney Wilson, BSN, RN, also known as The Nerdy Nurse, is an award-winning author and blogger, national speaker, and a highly influential social media personality. Brittney works hard to help others gain confidence in the digital world through her unique vision of technology empowerment. Her passion for informatics and innovation in healthcare is unmatched. She is a devoted patient, nurse, and technology advocate. She is also the author of The Nerdy Nurse’s Guide to Technology and blogs about nursing, technology, health IT, and other healthcare topics at thenerdynurse.com.